Our food Kitchen is up and running. Thanks to all your donations our facility is better than it was before the robbery. Our contractor was able to do some additional work for the same price, and he even did some work for free just to help us out, so now in addition to security bars, we know have a full awning on the front of the house, our tree was removed, and we have our drive way and the entire front of the house cemented. When the rainy season comes no tables will be in the mud, and our new awnings will keep the rain and the sun out. 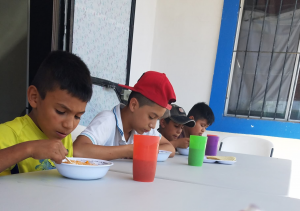 We are feeding around forty children a day (40), and the number is rising. Thank you all for making this possible. I am down to three chapters and my book will be done Thankfully, I have a trusted friend, Chris Lenz, who will be editing the book for me. I am sure with her editing it we do not have to worry about Moses getting on the Arc, or, Noah crossing the Red Sea (HA! HA!) All joke aside, please pray for my book; the goal for it is to reach and inspire people to go big for Christ. May 8th is the day we start work on our new church, and I we should have our first service in June. This has been a long process, and we are thankful to be starting. Waiting on the Lord for almost a year was quite difficult for me, and I excited to have the opportunity to preach each week. Please pray daily for our new ministry. We still are in need of sponsors to pay part of our $300 monthly rent. I will be in Texas in May or June and I need a sounds system and projector for our Church. In addition we are going to sell Imelda’s car and we need to buy a smaller car year 2011- 2014 that is good on gas in the $3500 price range. We also need a motorcycle that is good on gas for our ministry, so if you have one to sell or donate please contact me. Please pray for my family; my nephew’s baby girls died last week. They were only a few days old. We many family members are hurting and don’t have a personal relation with our Lord. Pray for their salvation please. It has many a long month with many great highs and lows and thank God we here trying to make a difference for the Lord. We love what we do, but it takes a lot out us both physically and spiritually. Please pray we find rest in the Lord. 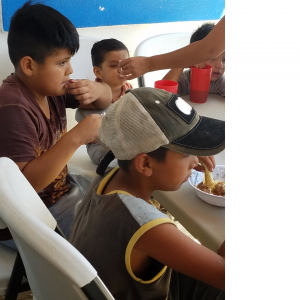 The needs here are so great, and thankful to your support we are able to minister here. Thank you all so very much. We are thankful for all your large donations to help us with our food kitchen. We have used all that money and what we need is monthly sponsors to keep us going. Our donations have been way up but so have our expenses. So please help as you are able.